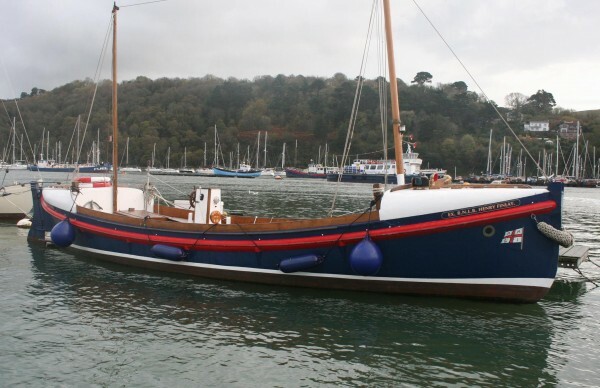 The Henry Finlay is a fine example of the early RNLI sailing life boat. It is amazing to us now that these boats were launched off a beach on a wooden wheeled “cart” then rowed to the casualty. Assuming that many “shouts” were as a result of bad weather rowing a boat like this off a beach and into a bad sea does not bear thinking about. She had 6 oars each side and set the relatively small sail area in the right conditions. The crew sat on hard wood benches, wore the old fashioned cork life jackets which cannot have helped rowing and to judge by the old photos a woolly hat was the dress of the day. 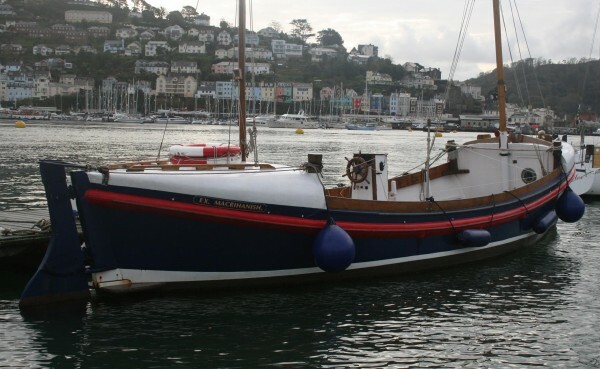 This example has survived in remarkable condition largely due to the fact that with the exception of the 2nd World War years when she was laid up she has been in constant service either with the RNLI or as a private boat doing tourist trips. The design is a long keeled boat with a fairly sharp stem, well flared above the water-line to throw the spray clear, a full mid-ships section for buoyancy and stability and a pointed stern to break the following seas with the rudder hung on the stern post. This is an open boat so to achieve the buoyancy required for an unsinkable life boat a cuddy is built at either end of the same construction as the hull but lighter and completely sealed and water-tight. Being quite high it also has the effect of making the craft self righting. 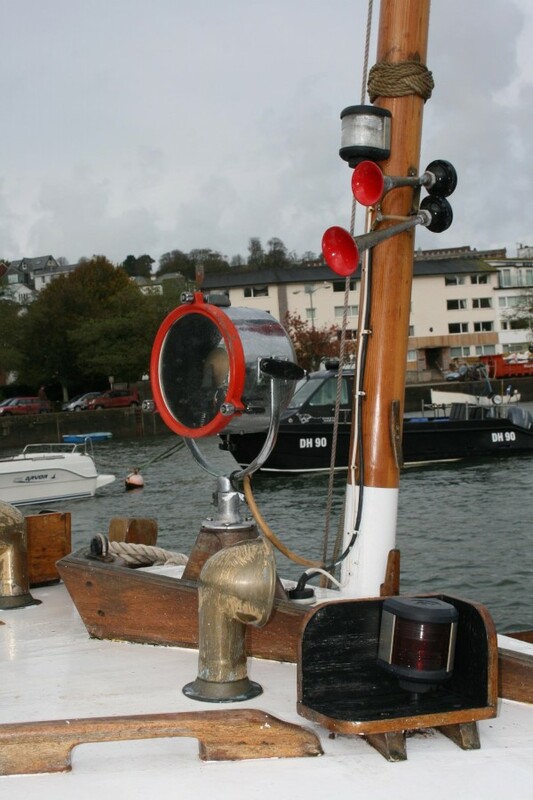 The Henry Finlay has a Harbour Master’s Licence to operate as a passenger carrying vessel including hours of darkness. 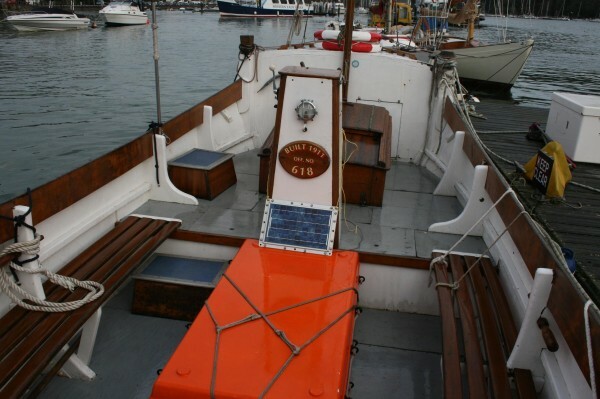 Typical of all life boats from the turn of the century to the last wooden boats of the 1960’s she is built of double diagonal mahogany. 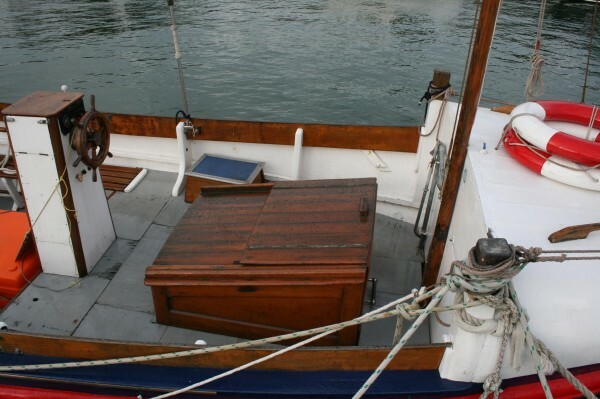 This involves laying boards of mahogany approx 6” x ¼” thick diagonally to the waterline, the outer skin diagonally over-lapping the inner skin and all through fastened with hundreds of copper nails and roves. Calico set in white lead was usually laid between the layers. 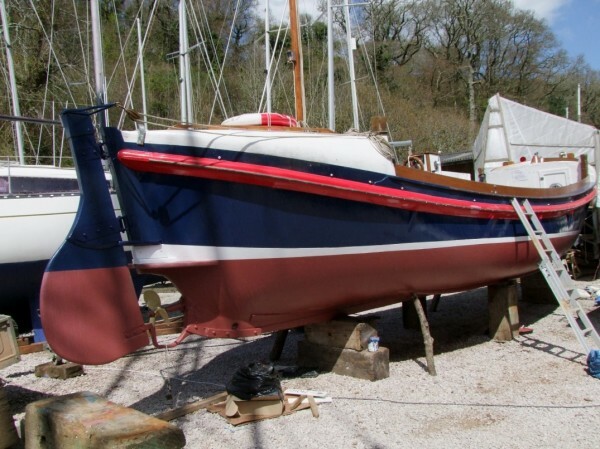 Many such hulls had 3 or even 4 layers resulting in a very strong, slightly flexible and totally water-tight hull yet surprisingly light due to the absence of the usual heavy oak frames. 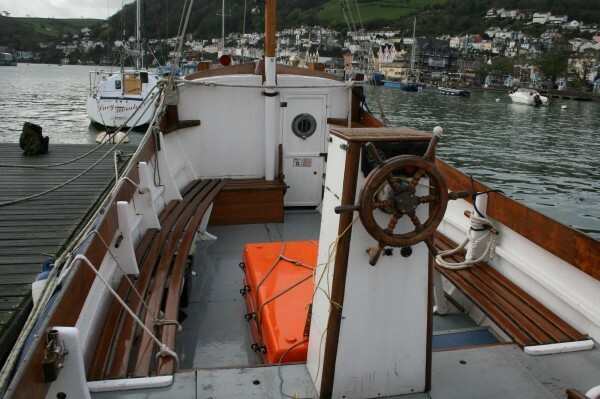 The hull is built effectively as 2 separate sides and fastened to the long oak back-bone with oak “floors” (structural cross members) across the centre-line. Gusset type frames are fitted every 3’ approx with twin stringers each side. 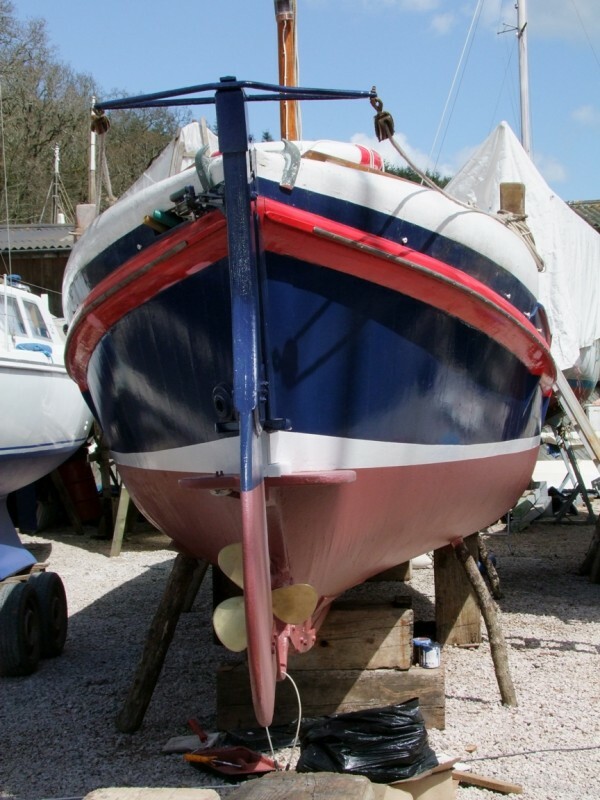 The varnished mahogany coaming on the inner face of the stout gunnel creates a girder effect giving the whole gunnel the strength required to resist side impact if coming hard alongside. Massive oak Sampson posts are fitted in each corner against the bulkheads. The forward “cuddy” contains a Portaloo chemical toile, warps and fender stowage and can be used as a shelter in bad weather for perhaps 2 or 3 people. A door in the bulkhead makes the space reasonably easily accessible. The after cuddy is used for stowage only with a smaller access panel. 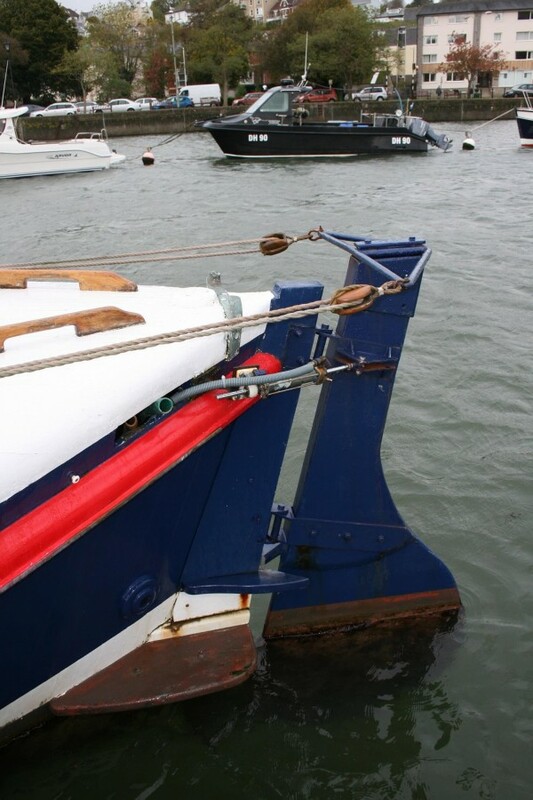 A rudder is hung the full length of the slightly raked stern post. 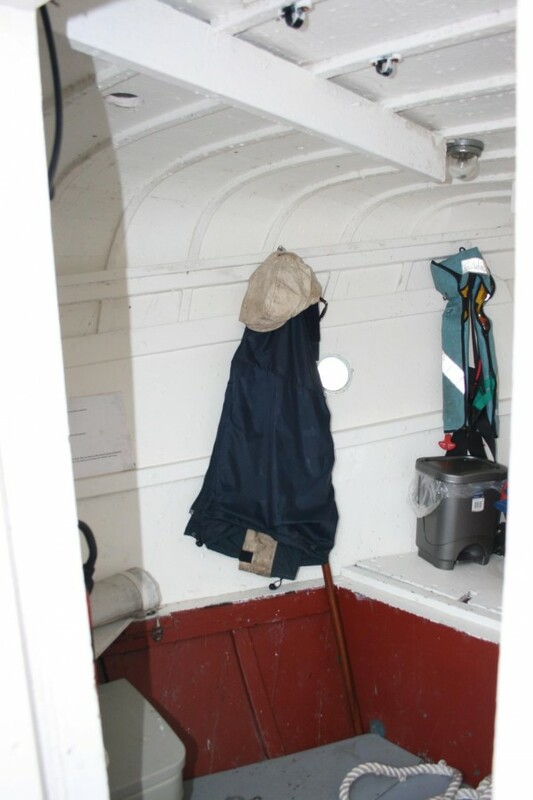 The original operating mechanism of a steel yoke on the rudder-head with tiller lines to the helmsman is still in place and rigged but a modern low pressure hydraulic mechanism is now fitted with a ram on the port side of the rudder head operated by a traditional spoked teak wheel mounted on a pedestal in the middle of the boat. These pulling and sailing life boats carried a 2-masted rig on light pole masts stepped on the keel against the forward and after bulkheads and setting a gaff sail on the fore or main mast and a small lugsail on the mizzen. The masts could be relatively easily unstopped and lowered. Varnished spruce masts. Synthetic hemp stays. The craft was built without an engine, the first engine being installed after she came out of service in Teignmouth in 1945. Now fitted with a Yanmar 3J2HE 3-cylinder diesel engine installed in 2013, flexibly mounted on massive engine bed. 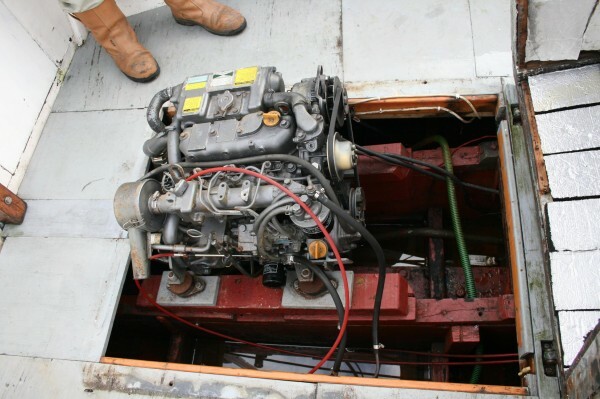 Yanmar single lever controlled gear-box with conventional centre-line shaft drive swinging a 10” 3-bladed prop. Morse engine controls and engine instrument panel mounted on the steering pedestal. 1 x 12v lighting battery. Engine alternator with splitting diode. Splendid all-over winter cover on wooden supports.